Alan Warner's novel The Stars in the Bright Sky posed a new problem for me in my trip through this year's Booker longlist - it's the sequel to a book I've not read. I toyed with whether I should prepare for this one by reading its predecessor (The Sopranos - and no, not that one), but decided that I should just judge The Stars in the Bright Sky on its own merits, as a standalone. That choice also carried the benefit of being easier. Anyway. 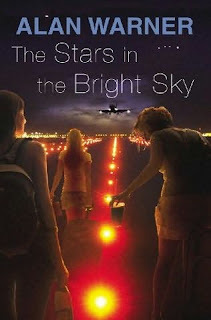 The Stars in the Bright Sky is about six young - mostly Scottish - women setting off on a quick, cheap holiday together. Five of them were friends at school, but two have now moved away from their small-ish Scottish town to study, and one of them brings her flatmate along for the trip. Plans constantly go awry, tensions between them all are revealed, and secrets are uncovered. Warner captures the dialogue well, and the book is mostly a quick & easy read. In our group, we have a group of contrasting types. The unofficial leader - certainly the planner - is Kay (one of the two from the original five to have moved away). The other student - who went all the way to London - is Finn, and her mysterious friend Ava (whom the others haven't met beforehand) drives much of the narrative action. Of the remaining three, Manda is the novel's clearest-drawn character - a loud, under-educated, frequently stupid &/or insensitive single mother. The other two, regrettably, are not all that distinct (one is a talented singer, the other is not) - and indeed often seem largely interchangeable. Granted, that may have been deliberate on Warner's part - to outsiders, it's probably quite common to see a group of friends & identify the organised one (Kay), the quiet & thoughtful one (Finn) and the loudmouthed one (Manda) and then the rest sort of blur together. Nonetheless, for me, that was one of the failings of The Stars in the Bright Sky - two of the six characters are not all that interesting, and one of the others is perhaps too much of a lout, constantly saying awful things, malapropising on almost every page & fitting too easily into the role of the insecure type who acts out in the most obvious of ways. The other problem I have with The Stars in the Bright Sky is possibly a little unfair. As I say, it was an easy & enjoyable-enough read, but I did frequently wonder why it merited Booker longlisting. The Stars in the Bright Sky seems to me to be a fairly straightforward novel about a group of friends who set off on a holiday. The writing, while rarely clunky (although it sometimes was) didn't excite me much, & there didn't seem to be much of a larger point or anything going on. Again, I realise this is unfair - it's more of a criticism of the Booker longlist than of the book itself - but I'd be very surprised if Warner's book made the shortlist. Next: tomorrow, the shortlist is announced. I'll do a quick post before then, summarising my thoughts so far & tipping what I hope the shortlist will include from the ones I've read to date. After that, I'm at the mercy of my fellow patrons of the North Sydney library, but hope to be able to get one or two of the remaining five by the end of this week.